Travelling in Japan and China I discovered my love for karaoke. Singing like there’s no tomorrow, even if you can’t really sing – what’s not to like? Until recently it was difficult to find venues to live out my new passion here in Zurich. Not any more, thanks to Sergio and his Fambar. 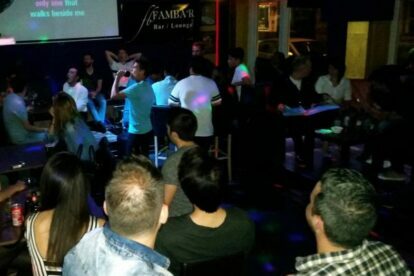 Here, every Friday and Saturday it’s karaoke time! And while you can’t rent a booth just for you and your friends like in Asia, the mood is usually so laid-back that it’s easy to become friends with everyone else in the room. If you’re not into that, don’t worry: there are other things. Regularly, Sergio organizes Pub Quizzes (German only) and Foosball tournaments on three tables, which you can use for free (if there are no official games, as this is also a venue for the local foosball league). Check out the Facebook page for upcoming events.